Hello I am so excited to be guest posting for Biana! My name is Amanda and for those of you who don't know me I reside over at a little space called Meet @ the Barre. I am a Pure Barre instructor (amongst my 3 other jobs) and I write about all things ranging from health and fitness to fashion all with a funny spin. If I'm sounding familiar it may be from Biana's B~inspired post. So for those of you who don't know this background Biana and I are literally soul sisters. We met through blogging and spent the beginning part of our relationship writing emails like pen pal style until B ventured out to ask for my phone number. I sent her a real life picture to let her and her hubby Gary know I was a real person and now we talk pretty much every day. So I thought for my guest post I would take you down the fashion route and highlight a trend that is blowing up this Summer. What is it you ask? Guess what? It's not another post about maxi dresses because if y'all know me......you know I cannot get enough of them. Nope this trend which is blowing up everywhere is the muscle tee tank. Obsessed with this Sea, Sun & Sand tank! I mean have you checked the back of it? It's so perfect to beat the heat. Throw it over your bathing suit or over a pretty back detailed sports bra oh and love this one and this ballet blush pink one here for Barre class. Or pair it with this crochet back bra or this amazing strappy one, these shorts and heels (obsessed with them) for a night out. I love when a piece is multifunctional. The Break the Rules tank with glitter details is super affordable. Kinda digging this Bob Marley one. Cheetah one is on sale! I mean glitter is basically in our veins right? 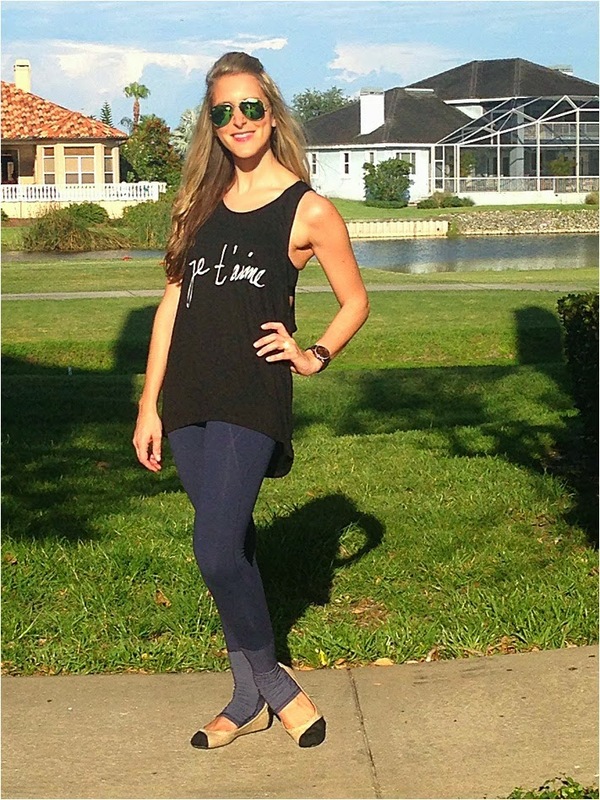 Finally this Je t'aime tank has been worn on repeat this Summer! love that you guys basically have the same life but in reverse :) I am in love with that je t'aime tank! I love it! I would be in work out gear 24/7 if my office allowed it. Tanks are super comfy and great for layering. All the sayings make an old standby a little more hip! I've been loving all the muscle tanks with the cute quotes! Love the one you're wearing!! I definitely thought you guys knew each other before blogging! So fun to read about how you "met"! I need some more tanks in my life and love all of the ones you picked out! Such a fun story about how you two met and loving muscle tees. The Glitter for Breakfast is definitely our favorite! I love muscle tanks for working out! They are light and airy so I don't feel so constricted or sweaty after a hard bike ride. You look fab as usual. I love them for working out and have a couple but Im not sold on them for just heading out though. Love it!! And you know I love Amanda. I have such fat arms though that the muscle isn't the most flattering for me but I like the styles you have showcased here that have a bit of a twist to them like the Marley tank. i would wear them to workout but not sure I could rock it just out on the town. Maybe with a blazer. I LOVE graphic tees and they are even better in tanks!! These are perfect picks! Digging these tanks- too cute and fun! Great post, A.! I love the longer tanks that can be worn like a tunic with leggings (my uniform piece, year-round). 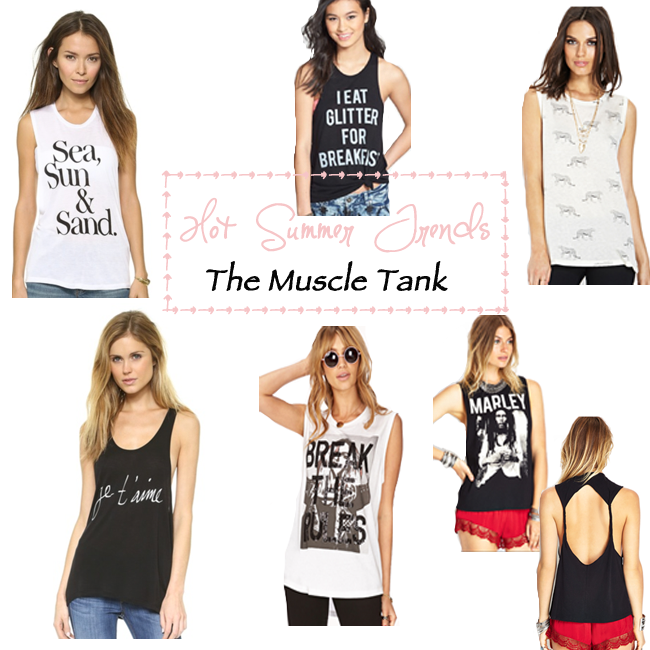 Oh yeah muscle tanks! Loving them! Loving these tank options! Too cute!